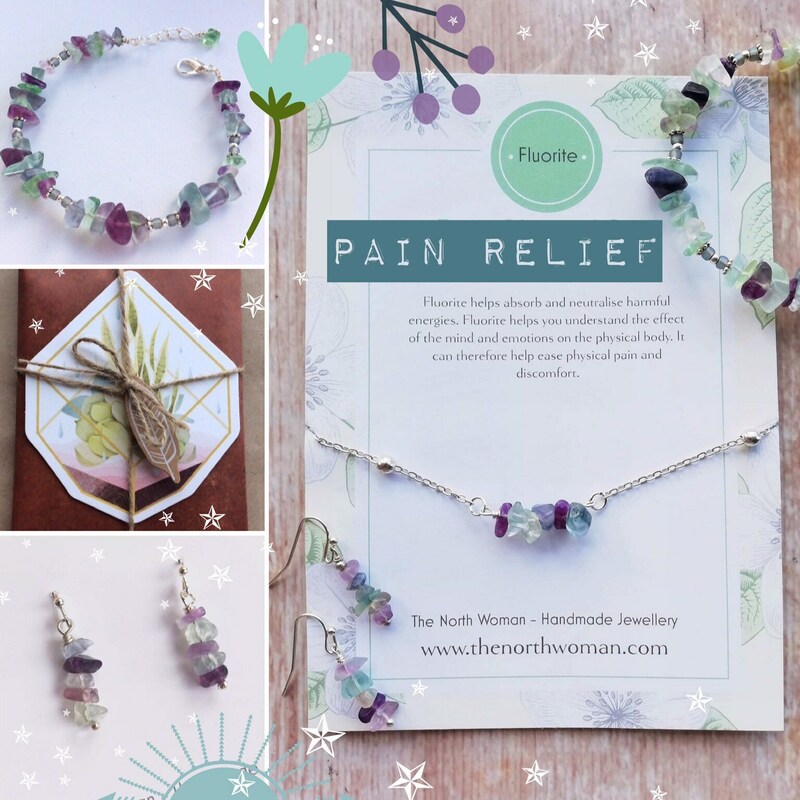 A collection of jewellery made with Fluorite healing Gemstones for aid with pain, helping to neutralise harmful energies. This includes a choice of 4 bracelets, 2 necklaces and 2 pairs of earrings. *Fluorite* - Helps absorb and neutralise harmful energies in the body. It helps you to understand the effect of the mind and emotions on the physical body. Fluorite can therefore help ease physical pain and discomfort. BRACELETS Choose from 1, 2, 3 or 4 (numbered on pictures). 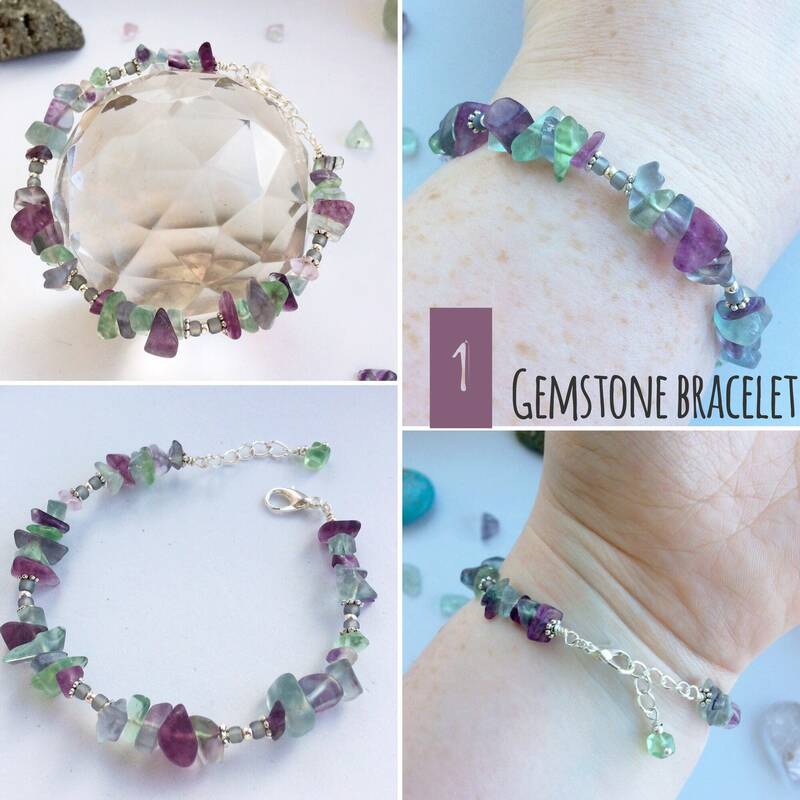 Bracelet 1: Gemstones - Adjustable fit from 18-19cm (7-7.4") filled with fluorite tumbled chip beads. 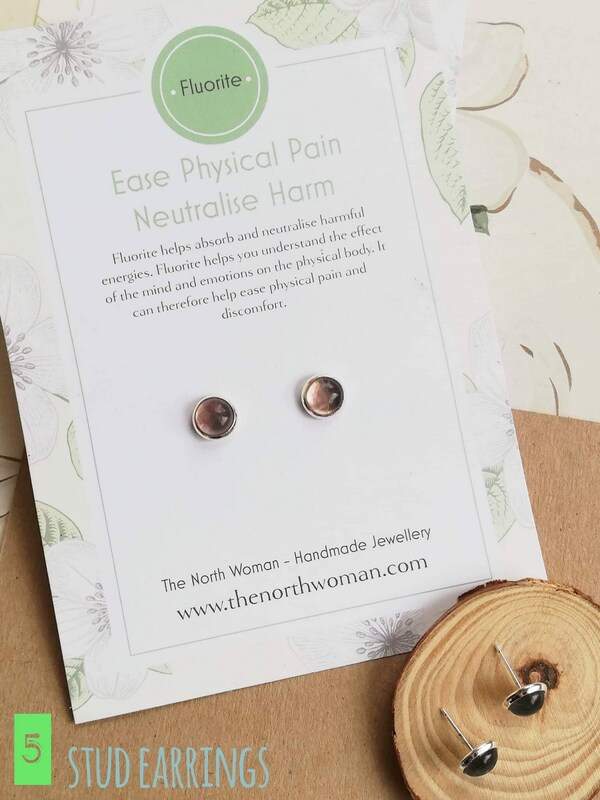 These are strung on silver plated wire and fasten with a lobster claw clasp. 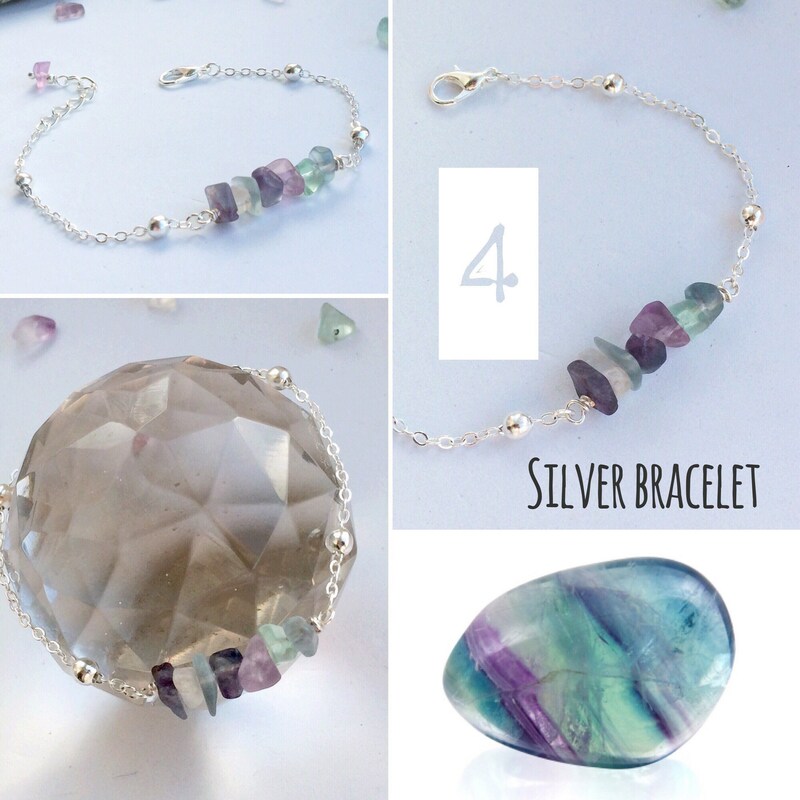 The fluorite is matched with metallic iridescent seed beads in a pastel blue shade. 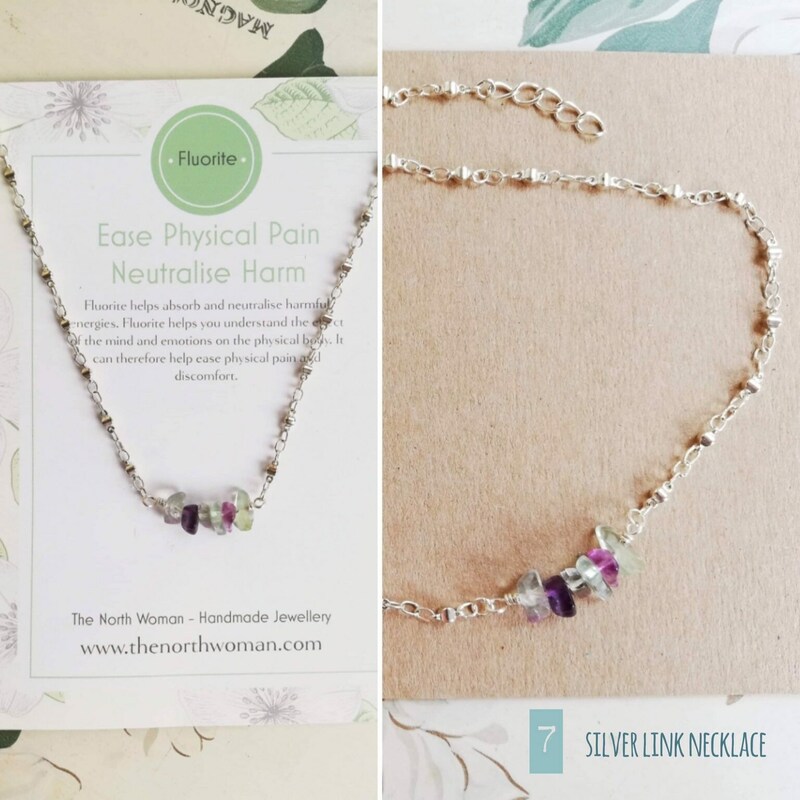 The extender chain is 2.5cm long and is finished with a matching fluorite bead. Bracelet 2: Copper Chain - Adjustable fit from 17-21cm (6.6"-8.2") with fluorite gemstone chip beads on a copper coloured chain which is decorated with small beads and finished with a rose gold lobster clasp. 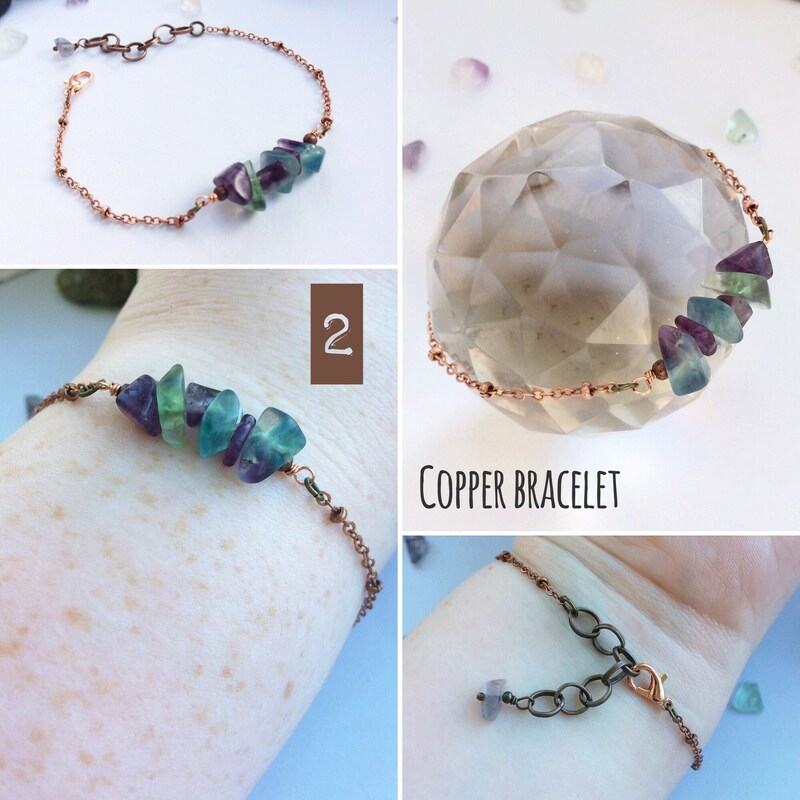 Adjustable fit with copper coloured extender chain which has a matching fluorite bead. A dainty, pretty, delicate design with rich vivid colours. Bracelet 3:Cord - Adjustable fit from 14cm. This unisex design uses adjustable nylon cord in a dark brown colour, about 4~6mm wide from 14cm long. This is adjustable by pulling on the strings, from a average ladies size to generous man's fit, each cord is finished with hematite beads. 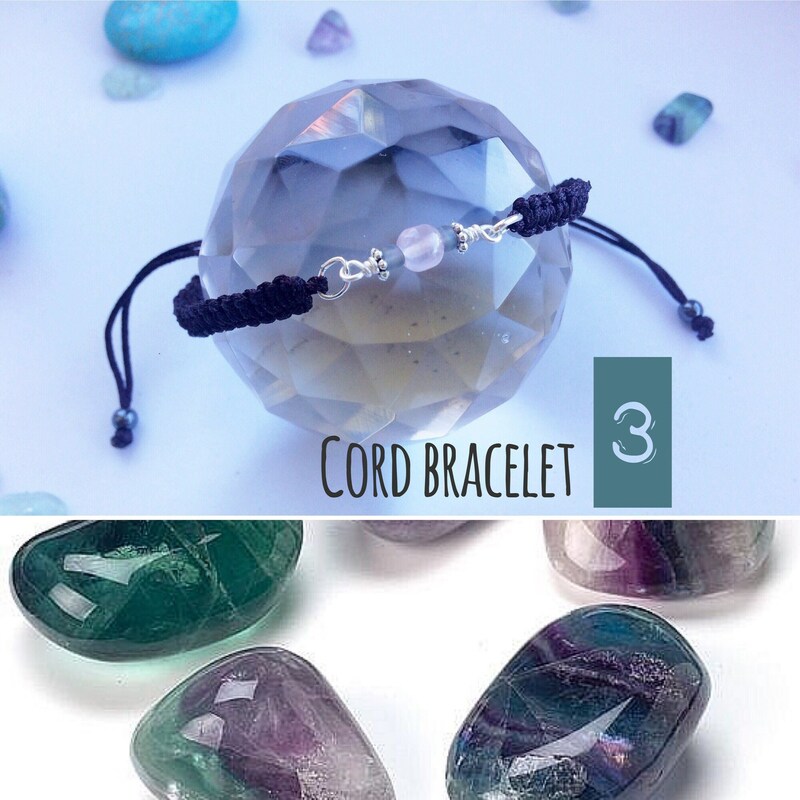 The bracelet features a single 5mm round fluorite bead with matte blue seed beads. Bracelet 4:Silver Chain - Adjustable fit from 18-20.5cm (7"-8") with fluorite gemstone chip beads on a silver coloured chain which is decorated with small beads and finished with a lobster clasp. Adjustable fit with silver coloured extender chain which has a matching fluorite bead. Earrings 5: Fluorite studs in 11mm silver plated cabochon stud setting. 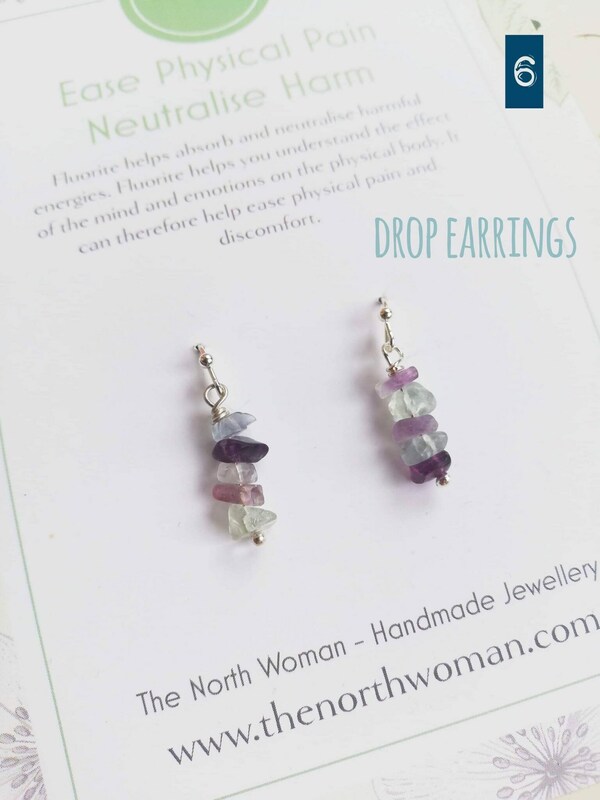 Earrings 6: 18mm drop length earrings with tumbled fluorite chip beads. On silver plated French style ear wires. Necklace 7: Fluorite tumbled chip gemstones on silver plated link chain necklace. Adjustable from 46-50cm. 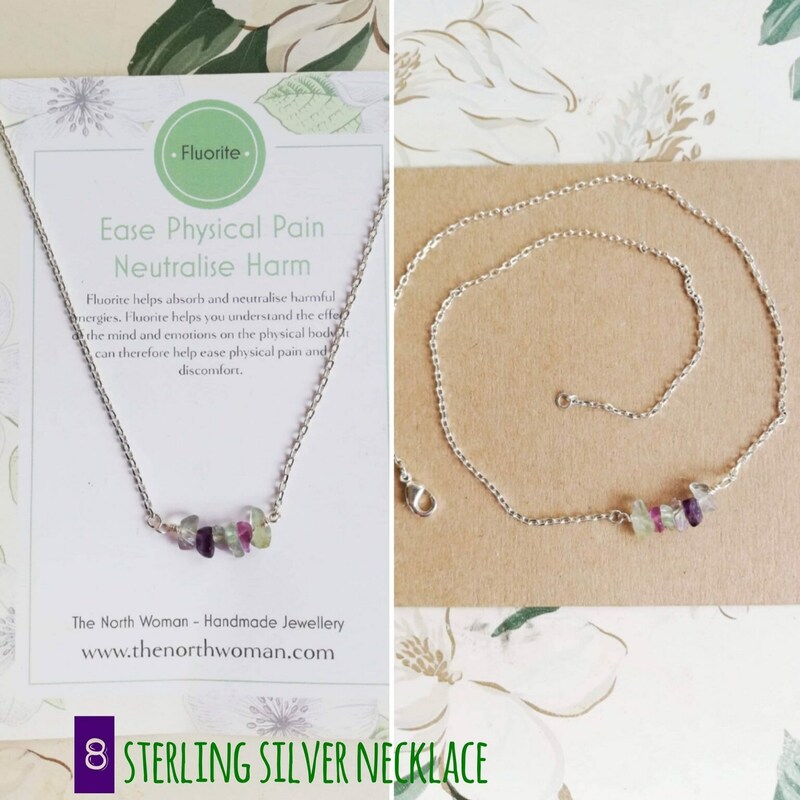 Necklace 8 - Fluorite tumbled chip gemstones on sterling silver chain. Adjustable from 38-43cm. I made a range of holistic healing gemstone jewellery pieces as I am very interested in the properties of these. 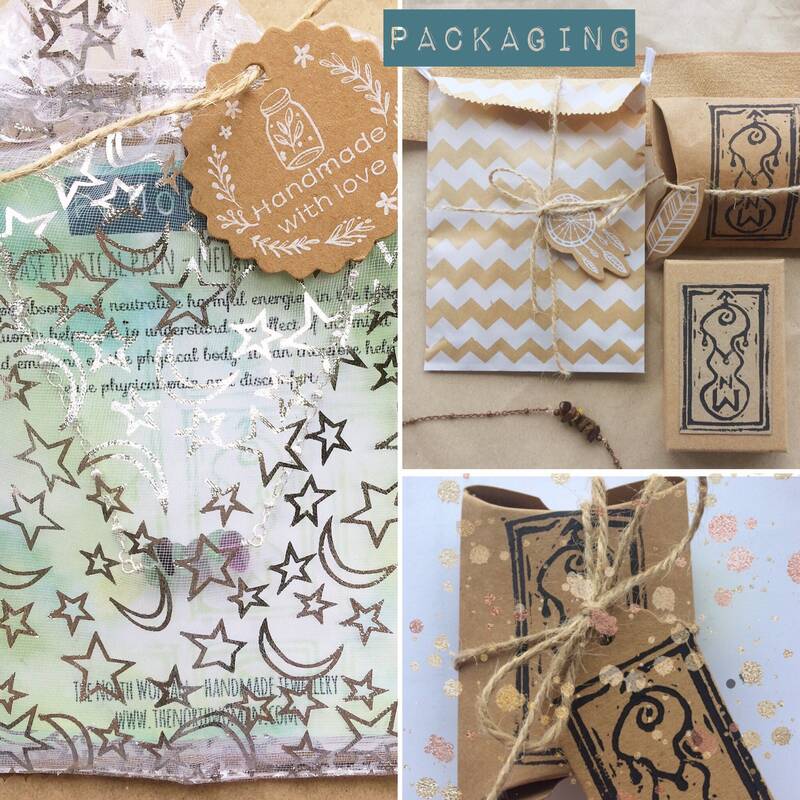 They are ideal for self-care and also make a thoughtful gift for others. See my shop for collections with amethyst (grief), rose quartz (relationships), blue lace agate (anxiety), howlite (stress reduction), and hematite (confidence). Beautiful! All I can say is beautiful! This is a stunning bracelet and looks gorgeous when it’s worn. The colours and gems go together fantastically and it fits perfectly too. I love this bracelet it’s amazing.